Seen above is St. Mary’s, on the corner of Gough Street and O’Farrell in San Francisco, its full moniker the Cathedral of Saint Mary of the Assumption. 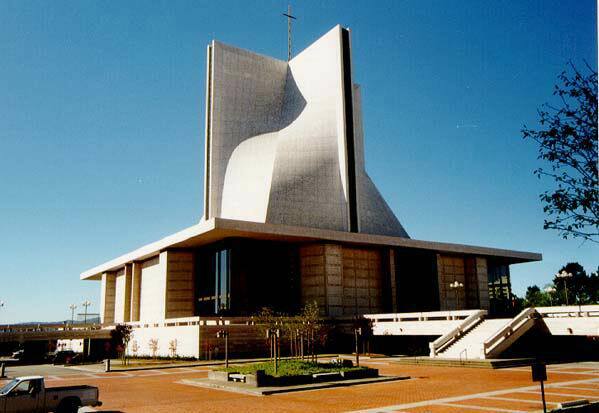 It was completed in 1971, to replace an earlier cathedral on Van Ness Avenue that was destroyed by arson in 1962. This structure is technically known as a “hyperbolic paraboloid,” and was designed to emulate a Vatican “miter,” which to us Christian Scientists is known as a “hat.” We will not include in this website that it has been dubbed variously as “the Bishop’s Bendix,” for its resemblance to the tumbler on a washing machine, that appellation given by who-else, Herb Caen. It has been also expressed as “Our Lady of Maytag.” Due to my vow not to trash this website with a bunch of inanity like I did the last one, these facts shall go unreported. An unintended consequence of its unique design is that the, well, chest, of any maiden in San Francisco, and probably elsewhere, is represented on its walls. That actually is not the building design itself, but the sun’s shadow on the two southern walls of the building. On those walls, on sunny days, the shape of any woman in The City, large or small, Catholic or Protestant, may be seen, at some hour on some day of the year. A gentleman might say, “My lady appears on St. Mary’s on April 14th, at 1:57 p.m.,” for on that day at that hour the shadow might perfectly represent her, over two hundred feet high for all the San Franciscans to view and applaud. 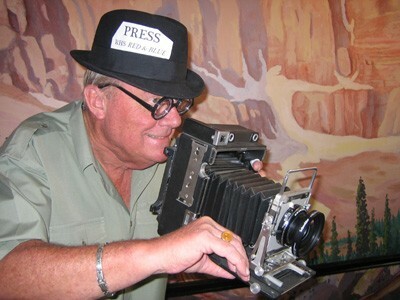 Caen discovered this, popularized it, and for many years it was a sort of local joke with San Francisco residents. And damn few of the visitors. I have not heard the thought expressed for many years. But while looking for the picture of the Queen Mary 2 in my “SF” photo file, the Bishop’s Bendix appeared and the devil made me post this. One wonders if even Pope Benedict himself is aware of it, and our thoughts of having two Popes with the same robes and hats loose upon the world, each given a certain degree of sense of authority, will go for another column.